So I got a new phone. I pretty much LOVE it. In so many ways it puts my old phone to shame. The only issue is the camera. So far the photos have been almost all blurry. : ( These ones outside are some of my favorites. They are a little clearer & captured action pretty well. WET!! The indoor shots were much more grainy. The color seems off too. But that didn't stop us from having some fun with them. I kinda like this one. Love this girl. See what I mean? Not so good. But I adore HIM. She has been the sweetest best girl lately. (Please don't let saying that jinx her!!!) They definitely improved outside. This is from our little walk through the woods the other day. John is so cute with his girls!!! I'm so excited for our trip!! 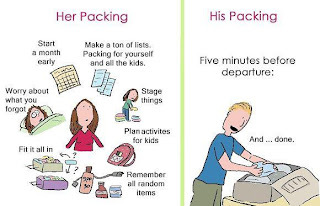 We leave tomorrow for Sacramento, right now I am busy packing, making lists, organizing & stressing over what I may forget. It's what I do. This picture couldn't be more accurate. None the less, couldn't be more thrilled to be going to Meaghan's wedding, spending time with our family & most of all getting some much needed relaxing alone time with John. We are beyond thankful for the wonderful people that are coming together to entertain our kids while we are away. I know you will all have so much fun together & IF I wasn't off flying on an airplane WITHOUT KIDS to sunny weather, wine & fun, there is no place I would rather be then there with you all! These two. So funny. Summer has come to an end so we are starting to frequent all the indoor play places we've been avoiding due to the weather being far too nice. We hit OMSI last week and we may just go there again tomorrow. Norah was so fascinated by these balls floating in the air. She ran around like a crazy person going from one thing to the next. I love how well she plays now. Although the drinking fountain always keeps one of the biggest pulls on kids, it's hard to get them to go play with the real toys they think it's so fun & WET. We still haven't gotten Norah off the bottle. Can't say we have tried too hard yet. She is a total addict to the thing. She only gets one or two a day but I know I need to end it soon. Just not a real big fan of her head spinning around. Also? I sort of want to keep her a baby a little longer. Can you blame me??? Here's something I made the other night for dinner. I figured I would put it up here so I don't forget how awesome it was. It's Tilapia with an almond/lemon pepper/dill crust along side roasted veggies with fresh garden tomatoes, basil and a balsamic glaze. I'm getting hungry just looking at it. It's so easy, you should make it. in a little food processor, pulse until it looks like thick powder. Line a cookie sheet with foil, spray with a little olive oil. over and do the same to the other side. season with whatever you would like. And it's really not very far. Such is life with kids, that's half the fun! We stop frequently. There are cool signs to read, like this. It says "Weeds for sale! Cheap!" We talk about all the things we see as we go. If Norah climbs on something, Ava follows suit. I swear they both are just waiting for the other to do something naughty to have an excuse to jump in. Two little trouble makers... ...thick as thieves. We run one way, we run back when we notice Norah is running the other direction... Ava helps wrangle her back in. She stops to examine things that fall from trees. Gathering them as she goes. Where is Norah??? "You can't see me" Wait! Bumpy things need to be felt! This is a good spot to chill. Hide & seek again, she really makes it tough, I will never find her! A drum!! And we are off! In one week we will be heading out for a trip to Sacramento, JUST THE TWO OF US. Yes, that's right, no kids. Although I'm a little sad they can't join us, I'm way more excited to spend 3 days with John. I haven't spent more then 1 night away from the kids EVER, as in I have seen them every single day of their lives. I'm proud of that, but also ready for a break. Anyhow, we are flying out on Friday & going to a little town called Auburn where we will spend the next 3 days exploring wine country, hiking & most importantly, seeing our beautiful niece Meaghan get married! We will get to spend some great quality time with our wonderful family. I'm so glad we won't miss Meaghan's wedding & I think it will be really good for us. My laptop is in the shop. Anyhow, I will be blogging from the phone for now. Ava just got this new flower press from my Mom's friend Dee Dee, just like one I had as a kid. 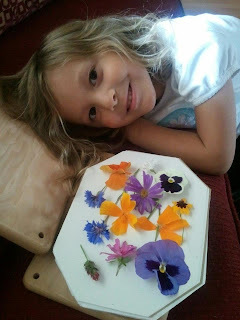 Ava was so excited to get started with pressing flowers right away, she was a little surprised when we recommended waiting a week or so before opening it up to give the flowers a chance to dry out. In her best little teenage voice she says, "Wait, what? A WEEK?? REALLY??" She has since pressed, opened & re-opened it about 20 times since yesterday. Oh well, saw that coming. Hopefully it will be back soon with not too much financial damage. I'm also hoping that dude fixing it cleans it while he's at it, that thing is a mess. This is a little all over the place but randomness is fun, right?? Norah has had money kept away from her forever. She will eat anything, well any non-food item, vegetables are totally safe around her, she won't touch those. Anyhow, now she is allowed to play with money and she is thrilled! She asks for it anytime it crosses her line of sight. Ugh. Speaking of talking, Norah is doing quite of bit of that these days. She has many phrases down. If she hears us talking about something she always chimes right in. On our last time heading to the beach, when we pulled into town, Mom & I were discussing how it was really foggy outside.